Find more information on our transfer process for foster carers. Anchor Foster Care is a family run, independent, not-for-profit organisation proactively working to provide the right kind of care and support to children and young people in our care. We provide a fostering service that develops and encourages both new and experienced foster carers to achieve good outcomes in a safe, stable and nurturing environment. 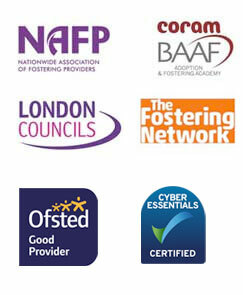 In partnership with our committed foster carers, we work tirelessly to deliver a service that provides safety, stability and hope through robust support for our committed foster carers and their families by providing regular training, 24/7 responsive and practical help, access to educational and therapeutic services and a small family feel environment. Anchor Foster Care is a Not-For-Profit agency where all money is put back into helping to provide children and young people in foster care with safety, stability & hope because we believe that a secure base is a critical aspect of enabling children and young people to realise their potential. Our relentless pursuit of this vision and passion through our committed foster carers and their families, our hardworking staff and anyone else who is part of the "Anchor Family" has helped us to remain a child/young person-centered fostering service with a family feel. We are looking for foster families for children with a wide range of different needs. Where are Foster Families Needed?